“Friends, Romans, countrymen, lend me your ears…” Perhaps you’re heard this famous Shakespearean line. We’re not entirely sure, but we suspect he was about to say, “Monograms has made it easy for visitors to come to Rome-as well as Florence and Venice.” In fact, on this Italy trip, we’ve arranged your hotel reservations, sightseeing, daily breakfast, transportation between cities, and transfers from/to your hotels to/from the train station. Plus, a one-of-a-kind feature is the Monograms Local Host®, someone who is there throughout your stay to help you feel comfortable, answer questions, offer suggestions, and help make sure your Italy vacation runs smoothly. 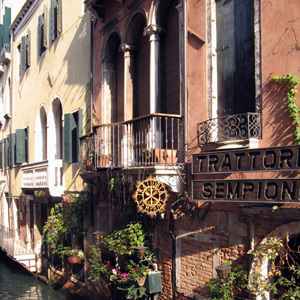 You’ll have a Local Host in Venice, Florence, and Rome. And don’t forget…your Italy trip includes transportation on the high-speed train (first-class) between the cities. We’ve even included the transfers so we’ll pick you up at your hotel, take you to the train station, get you on the correct train, pick you up at the next train station, and bring you to your hotel in the next city. Plus, sightseeing includes VIP access, which means you get to skip the lines at the attractions, such as the Vatican Museums, the Colosseum, and the Roman Forum. That saves over four hours of time just in Rome. That doesn’t include all the time we’ve saved you by handling your vacation details-not to mention the time saved by having a Local Host there to assist you rather than reading guidebooks and trying to figure it out on your own. This trip to Italy is a vacation of a lifetime! ~ Take a ride on a stern-wheeler or windsurf the river. ~ Explore restored shops and historic buildings in Old Town. ~ Catch a seaplane for a bird’s-eye view of the coast. ~ Visit the Fly-Fishing Museum or try your luck on the Siuslaw. ~ Tee off at Sandpines, Golf Digest’s Best New Public Course of 1993.